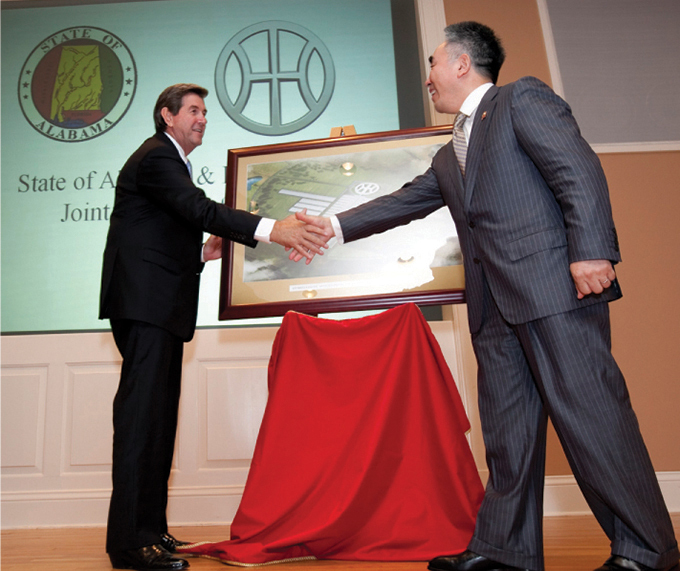 Governor Bob Riley greets Hybrid Kinetic Motors Chairman Yung Yeung. In September 2009, the third richest man on the Forbes 2001 rich list, Yung Yeung, showed up at a press conference in Montgomery with Gov. Bob Riley to announce plans by his company, Hybrid Kinetic Motors, to build a $1.5 billion auto plant in Baldwin County, to employ 6,000 workers and produce 3 million hybrid vehicles a year by 2018. Heading up the Mississippi plan was Charles Wang, a former partner of Yeung. Back in China, they had gotten rich running Brilliance China Automotive Holdings Ltd., a Chinese state-owned maker of SUVs. Both left China after a falling out with the government and moved to Singapore, where they conspired to become the world’s largest producer of hybrids. Then the two partners had a falling out of their own and formed separate companies with the same mission. Yeung staked out Alabama. Wang, Mississippi. “Actually, it’s a visa factory” reported Automotive News. The plants were a scheme for wealthy Chinese to invest as little as $500,000 in return for a permanent green card. A successful visa scheme, if that’s all it was, probably would have required a more viable U.S. operation. Neither plant ever broke ground. But maybe green card investors in the U.S. are now turning the tables on China. In 2017 Yeung’s representatives, at the Shanghai Auto Show, announced plans for producing hybrids in China. Hybrid Kinetic Motors, using U.S. technology, they said, will build plants “in three to five locations across the country, with an initial production capacity of 300,000 units within three years, eventually expanding the capacity to 1 million units,” reported the South China Morning Post.